This insightful essay describes African-American life at Monticello and Jefferson's role as a slaveholder. 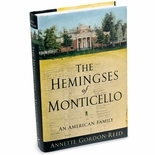 Includes a fold-out genealogy of the Fossett and Hemings families. By Monticello's Shannon Senior Research Historian Lucia Stanton with preface by Julian Bond. Paper, 58 pages.